Détendez-vous et profitez d'une belle et grande propriété boisée dans une cabane de vacances moderne très bien entretenue de 3 chambres à coucher, 2 1/2 salles de bain située dans une impasse tranquille à seulement 200 mètres des magnifiques rives du lac Tahoe et de Hurricane Bay Beach! Parfait pour les activités d'été ou d'hiver. Les stations de ski de Squaw Valley, Alpine Meadows, Granlibakken et Homewood se trouvent toutes à quelques kilomètres de distance. Faire du ski de fond ou de la raquette depuis la porte de la cabine jusqu'à la région de Ward Creek. Randonnée pédestre, vélo, natation et pêche ne manquent pas! hamac, fers à cheval, jeux de fléchettes, lancer de sacs, lancer de bol. I like staying at this cabin, very cozy, organized, clean and up graded kitchen.. The owner Gene and Mary are assuring you get there safely to their place.. I definitely will come back here again and recomend this place to my family and friends..
We had a great time at Shady Lane! Everything was perfect! Very good detailed instructions. The cabin is set up so it is very easy to get set up for our stay. We love the location and look forward to staying there again. We enjoyed our stay here so much and the cabin did not lack anything. We had a wonderful stay at The Huebels home on the Westshore. It is very clean, warm and well-appointed with all the essential amentities. 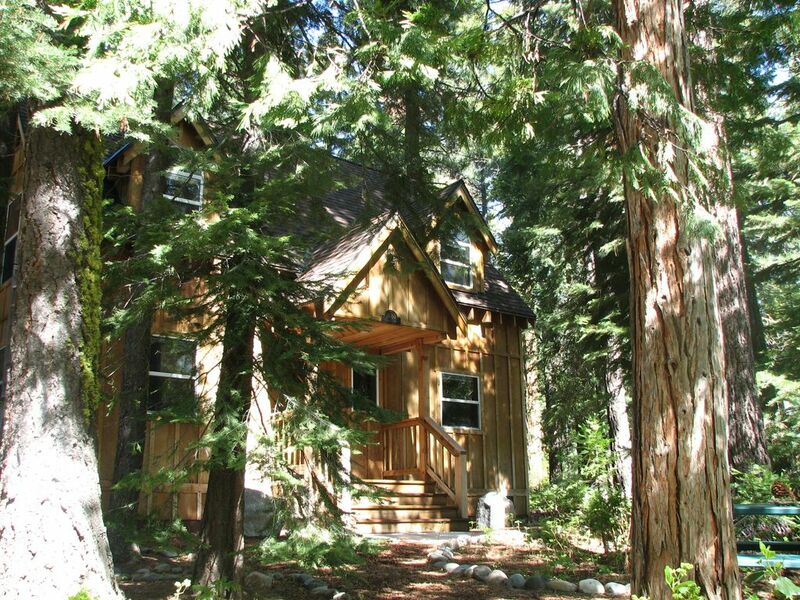 The location is great with close proximity to several markets and a 5-10 minute drive to Homewood in one direction and to Tahoe City.in the other direction. The neighborhood was quiet and easy to navigate in and out of in the snow. We would highly recommend it for a small family! We had a wonderful few days over Christmas at the Shady Lane house. The house/cabin was well taken care of, very clean, and the layout was very comfortable. We were 4 adults and 4 kids (ages raging from 6 years old to 8 months old). I liked that there was not any/many little things standing around that the kids could break - thus not necessitating me to have to re-organize and move a million little things as usual! It was close enough to Tahoe City to make it easy to get groceries, do touristy things (including sledding), but far enough to give the idea of being in your own world. We were lucky to get a snow storm on our second day, and the kids loved playing in the snow in the backyard, and building their own snowmen. Would definitely visit again! Marchez deux blocs de la plage Hurricane Bay pour la baignade ou la pêche. Seuls deux blocs à la State Park et Ward Creek pour la randonnée ou le ski de fond. Vélo à proximité Blackwood Canyon, Paige Meadows, Sugarpine Point State Park, ou célèbre Emerald Bay. Prenez un radeau insouciante facile descendre la rivière Truckee de Fanny Bridge (3 mi. Distance) à River Ranch pour le déjeuner! Rive-Nord ou du Sud jeu seulement 20 minutes! $249 per Night Credit Card payments only accepted! 4 Night minimum and 2 Week minimum prior notice. $1743 per Week. Cleaning Service already included! Minimum 25 yrs. age to secure rental Refunds minus service fees available if cancellation more than two weeks prior to rental. Please email owner TOLGENE@AOL.COM to confirm reservation!